How does coaching help when leading sales teams? Coaching can help generally in the workplace, and not just when leading sales teams. From a management point of view, it’s a great skill or ability to have, regardless of the team you are leading. Here, Richard and Graham look at how knowing the way to coach properly can be invaluable in helping develop your people, including sales teams. The first thing to know about coaching is that many people misunderstand what it is. Mention the word and their first thought is possibly about a sports coach, shouting at their team from the sidelines, imploring them to do better. Or they see it in a negative context, imagining a formalised session with their manager in which coaching is a remedial tool to improve their failing performance. Although coaching can sometimes be about improving poor performance, equally it can be about helping someone who’s good to get even better. It assumes that the person has some understanding of their role, as well as a certain level of skill and experience. Coaching should unlock the potential of the individual. Once the questioning has helped someone find their focus, a good coach will then help them open up their thinking by asking more questions: “So now you know what you want to do, let’s think of ways you could do it.” Get creative and try not to tell them exactly what to do. It’s sometimes tempting for managers to say “When I did your job, what I did was…” or “If you look at so-and-so, what they’re doing really well is this…”. Instead, explore options and draw on what the individual knows or is good at. A good coach encourages people to think for themselves, rather than telling them what to do, which will limit their thinking. The next essential part of coaching is to ensure that the person is going to take ownership of what’s been discussed. How are you going to make sure they will put things into action, that they have bought into it? Check their motivation and confidence. Ask when they are going to start? What’s the first action? What specific things are they going to do? Finally, always offer follow-ups: “What can I do? How can I be of help to you?” And remember, coaching doesn’t have to be formal. It can be as simple as a five-minute chat after a meeting, or in the canteen over coffee. If someone starts a conversation with you and you’ve asked them some questions which have helped with their thinking and their actions going forward, then you’ve coached them. Cognitive disfluency: What does it mean for your organisation? In our work helping business teams to become more engaged and active with learning, time and again the concept of cognitive disfluency comes up. The idea that we process information differently depending on how much effort it requires is a fascinating one, so we thought we’d take a look at it in more depth here. Cognitive disfluency is a term that was first coined by the psychologist Adam Alter, assistant professor of marketing and psychology at New York University’s Stern School of Business. What it essentially describes is the idea that people process information differently, and that some of it is easy (fluency) and some of it requires effort (disfluency). An example of how this works was shown in an experiment that presented a printed question in two different typefaces – one hard to read and one easy – and asked people to spot the mistake. The proportion of people that noticed the error in the hard-to-read font was higher than the easy-to-read one. Alter suggests that a harder-to-read font makes us put more mental effort into reading, and we are therefore more likely to retain the information. On a wider scale, fluent processing allows us to take in key information quickly but not necessarily to retain it or even understand it in a meaningful way. The whole experience becomes meaningless, less engaging and unsatisfying. Conversely, we process disfluent information more carefully and deeply, and this naturally results in us understanding it better. This is why the idea of cognitive disfluency has been suggested as a great way to assist learning. Why is cognitive disfluency important in business? Think of all the data and information that is presented before us – or our teams – within the workplace. Most organisations now offer their people key decision data in an easy (fluent) way, whether through dashboards, reports or search engines. While these tools can be invaluable, they can also make the data meaningless and hard to retain because they allow people to get to the specific number, target, forecast or performance data whenever they want to. This often means we don’t have to think about, generalise or extract the data. So why is that a problem? Well, if people don’t have that data with them when making key decisions, or if they don’t have an intuitive understanding of the information and what it means, they will be unable to incorporate it in their decision-making. They will also be unable to learn from it. Data creates knowledge, and knowledge creates understanding – but when there is too much fluency in the information, it reduces this second step. So should we make information more disfluent? A lot of the data that we use day to day needs to be fluent. We need to be able to access and use it quickly, so it should be easy to digest. However, information that is easily consumed is also easily forgotten. In almost everything we do there are a few key measures that tell us how we are doing against our goals and targets. Data such as production data, sales information or financial projections need to move beyond abstract numbers and become more intuitive, becoming much more central in our awareness, moving from organisation knowledge to personal understanding. It is this data that needs to be deeply understood so that it can underpin the decisions we make. How should organisations present their people with important details and data to ensure it is meaningfully understood and retained? A word of caution, though: Disfluency should be used sparingly. We’re not suggesting that you should make your people work hard for every piece of information they need. After all, not all data needs to be retained or fully understood. In addition, too much disfluency can be draining. It uses up more energy, increases complexity and heightens stress levels. Instead of continuous disfluency, there should be brief moments of it when appropriate for processing essential data and information. How should we bring the (sales) number to life? Bringing the number to life is vital, whether you’re working in sales, managing a project, leading a team or running a production line. If you understand and internalise the number, it allows you to monitor your progress and your tracking, intuitively know where you are and what you need to do, inform your decisions, understand how you need to react in real time, and see the bigger picture. Otherwise, it’s just meaningless data to you. Here, Paul and Rob discuss why many people are looking at the numbers but not really thinking about what they mean. They discuss the importance of bringing the number to life, and how we can do it. What’s stopping us from bringing our number to life? There is too much information at our fingertips. The desire to measure everything. So, how do we bring the number to life? Instead of looking at the data and feeling that we have to do something with it, look instead at what you’re trying to achieve. What numbers do you need to pull out and understand to reach your goal? Leaders. If you’re a leader, help your people to work with the data and think what the number really means. Give them the raw information they need and ask them to compile a report about some of the core data. You could break it down and ask different people to look at particular bits of the data. Ask them: Help me understand what’s in your figures and what does that tell you? Are you seeing what I’m seeing? Why has this bit changed? What does that mean? Why do some sales people only think about the sale? In our work, we usually tell people that having focus is a good thing. But when it comes to sales, just being focused on the sale and nothing else is not so good. Sales is part of getting your service to your customer, but you can’t just be focused on that – you’ve got to have a bigger purpose as an organisation. In this podcast, Richard and Graham discuss why some salespeople only think about the sale – and how such tunnel vision can impact on your customers and your colleagues. Sales people are, of course, very targeted and often very driven by what they need to achieve. But having such a singular focus can mean you forget about the other important things that sit around the sale. Of course, if your job is in sales, you need to be concerned with ‘the number’. But you also need to consider the customer experience, your product, the health and wellbeing of your colleagues, and your organisation’s culture and ethical boundaries. Ask yourself: If I make the sale in this way, what does it mean for the customer and for us as a business, and how might it impact on the other departments? Considering the culture of your organisation is particularly important if you’re the person setting the targets. Be mindful that the targets you set will drive a certain kind of behaviour so make sure that the sales process you’re encouraging reflects the culture of your organisation. Over the last 15 years I have worked with many senior leadership teams that are grappling with necessary organisational changes. These are often to take advantage of market or political trends, consumer demands, or to gain first mover advantage. Having said that, in one case a number of years ago, it was because the senior team had been given the feedback that the vast majority of people in the business were unhappy. It was around this time that I became interested in the subject of trust. It seemed to me that the leadership team mentioned above just wasn’t trusted anymore. Nobody believed what they said. Since then, I’ve seen it time and time again. A leadership team that thinks if they make the right noises for a while, people will get on board. A lack of trust in all walks of life makes things very hard. Do you like being around people you don’t trust? Of course not. It brings a heightened sense of anxiety and caution to everything we do. If you are in this situation on a daily basis or in your personal relationships, it makes life unbearable. My work over the last few years has led me to talk to teams about the need for them to rebuild trust or ensure they are trusted before embarking on changes, big or small, in their organisations. As ever around the subject of change, some people get it but many don’t. Many assume that just putting a good plan in place and some positional authority behind what they are saying means that people will just come on the journey with them. I would then ask people in the organisation three simple questions based on these factors. 1. On a scale of 1-10 do you think the senior team are competent as leaders? 2. On a scale of 1-10 do you think they are honest with you? 3. On a scale of 1-10 do they do what they say they will do? I’d then take all the responses and convert the answer to each of the questions into an overall percentage. As I said, very rudimental! However, it did give me a really good guide about how much people trusted their managers and team leaders. I then went back to senior teams that were being given a score of 50% or less by their people, and suggested that they should think twice before making any changes of significance in their organisations, and instead wait until they had won back the trust of their people. Recently, I came across something along the same lines as my research, although rather less basic! While on a long train journey, I was flicking through Ted Talks on my laptop when I saw one by Frances Frei, a professor of technology and operations management at the Harvard Business School. She had been working at Uber following their recent problems, and had noticed three things that were broken in terms of trust within their culture. Firstly, I was really pleased to see that my own limited research had given results that were similar to those Frances was talking about. However, as only one of us is a Harvard professor, I am more than happy to take and work on her three factors! So, why not ask yourself the following three questions, either in relation to the people you lead or the people who are leading in your company. 1. Authenticity – Are they seeing the real you? 2. Logic – Does it (whatever it is you are proposing) or do you make sense? 3. Empathy – Do people see that you care about them? If any of these three are missing, the whole thing goes very wobbly and certainly means you don’t have the basis on which to launch a programme of change. How can you talk yourself into the sale? Assumptions, beliefs and past experiences are going to shape how we think about the sales process and the customer. Added to that, we also have to deal with pressure from targets and our managers.This will all condition how you behave during the sales process. In our latest podcast, Ricky and Rob first discuss the reasons why we typically talk ourselves OUT of the sale, before looking at ways of talking ourselves INTO it. Reasons we might use to talk ourselves out of the sale include making assumptions that our competitors are better than we are or that the customer doesn’t want what we are selling. We’ll second-guess how the customer’s going to react and what they’re going to say. We’ll ask ourselves: Why do they want what I’m selling, and why do they want it from me? Am I good enough? Is my product or service good enough? So, how can you turn that around and to talk yourself INTO a sale? Firstly, focus on all the great things you do, the great experiences you’ve had in the past, and the wins. Play over the narrative that was in your mind when you did well in that call, sales meeting or sales follow-up. Get other people involved, if possible. Reflect on a sales meeting with a colleague or sales manager, look at the successful elements that you can draw upon and learn from. For the less successful parts, think what you might do differently next time. Be self-aware. You will only improve if you can reflect and learn from what you do. Nurture a growth mindset in yourself. Ask: What can I learn from this? Finally, during that next sale, don’t get caught up in the moment and in the pressure of having to make the sale, or the need to deliver targets or win a new customer. We might wonder if our product or service is good enough, or worry that we don’t understand the product fully. As sales people, we’ll focus our attention on the product’s weaknesses, which we may have to defend, but spend hardly any time on why the product is great. We need to think from the customer’s perspective, not our own, and see the world the other way round – after all, they are buying it for what it can do, and not what it can’t. What you actually want is to get the right outcome for the customer rather than selling for selling’s sake. Just focus on building a great relationship, understanding your customer and what they need, and then positioning your product for them. People very rarely like to talk about politics in the workplace. Perhaps we don’t even like to admit that it’s a thing. But the fact is that everyone in your organisation is acting in a political way. That’s because workplace politics is about how we behave towards each other, and what our motivations are in doing so. It’s all about power, authority and relationships. This power can come from different sources: It could be based on someone’s role, experience, knowledge, professional or personal network, or charisma. The term ‘office politics’ usually has negative connotations, but is it really always a bad thing? The answer is no – but it depends what kind of politics are in play. Good politics is about doing things correctly and fairly in the interest of the group and the overall vision, whereas bad politics is about acting out of self-interest. Particularly during the process of change, behaviour needs to be driven by politics – there needs to be somebody who is able to engage people and take them on a journey. That’s what change leadership is all about. As a manager of people who will behave according to their own politics, awareness is key. Often change leaders involve people for the wrong reasons. It’s easy to make the mistake of involving someone because of their position or their relationship with you. It splits people into one of four categories: sheep, donkeys, owls and foxes. Once you understand which category a person fits into, you’ll have an idea of how they will approach things, and what kind of role they should take on a project. It can be particularly helpful when implementing change and thinking about the kind of people you can rely on to lead it successfully. So what kind of characteristics does each animal show, and what does this mean for their role in the team? Sheep are politically naïve but act in the group’s interest, because they think it’s the right thing for the organisation and the people. They are loyal and industrious but need to be led. Donkeys, like sheep, are politically naïve – but the difference is that they act out of self-interest. Owls are politically aware of the situation and the environment but ask how to do things for the overarching goal and the people. Loyal to the organisation, they possess integrity, and are respected by colleagues. Foxes are also politically aware but act out of self-interest, putting themselves before others and even before the organisation. But there’s no doubt that they can make things happen, even though they are doing it for their benefit. There’s nothing wrong with sending a wily fox into a difficult situation as long as you are prepared to manage them closely. Foxes are useful, but make sure you’re aware of their motivation, how they are likely to behave and the opportunities they may want to seize for themselves. Dealing with these different personalities as a manager can be difficult, but the first step is to recognise who fits into each category, and to understand who should therefore be placed in a key role for a specific project, and who needs to be carefully managed. Owls are clearly prime candidates, although they may as well be unicorns as they are so hard to find! Perhaps you may like or require the ambition and drive of foxes. The role of a leader is not to get lost in politics or to turn a fox into an owl. It’s about recognising which political ‘animals’ are in your team, and being aware of how best to manage them. Baddeley, S. and James, K., 1987. 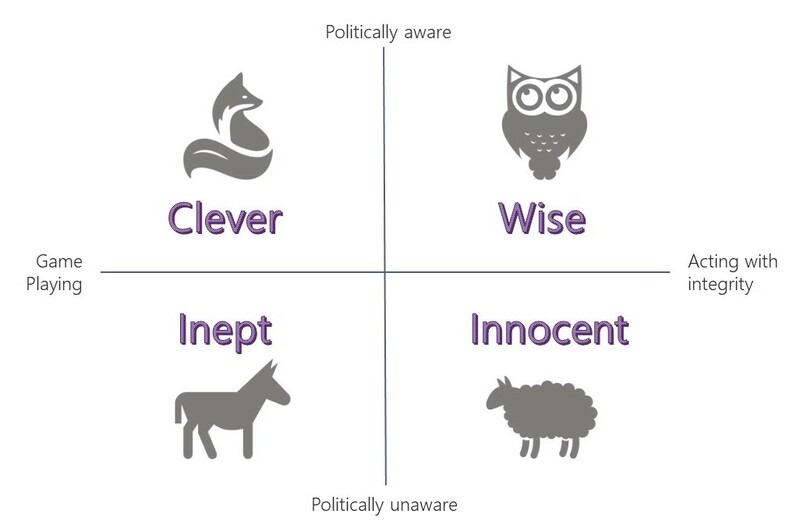 Owl, fox, donkey or sheep: Political skills for managers. Management Education and Development, 18(1), pp.3-19. Thinking Focus has been announced as a finalist in the Learning Awards 2019, a prestigious celebration of outstanding achievement in workplace learning and development. The company, which was founded in 2016, was among hundreds of entries from companies across the world, and is vying for the title of Start-Up Learning Provider of the Year alongside five other organisations based both in the UK and abroad. Ricky Muddimer, a director at Thinking Focus, said: “We’re delighted to be shortlisted in the Learning Awards and to be recognised for our achievements since setting up the company just over two years ago. “The last couple of years has seen Thinking Focus win 49 new clients, work on assignments in 12 countries and across 21 sectors, and meet, work with and develop well over 2,000 interesting and inspiring people. We’ve also taken on our first employee, produced a book and created a gamified learning product called What Would You Do? which helps develop managers in a way that makes learning stick. Run by the Learning Performance Institute, the Learning Awards are a leading event in the learning industry, and recognise outstanding examples of high standards, best practice, innovation and excellence in the corporate L&D sphere. Around 400 people will attend the glittering presentation evening at the Dorchester Hotel, London, in February next year. Thinking Focus are people productivity specialists who work with organisations around the world to unlock productivity, implement change and deliver sustainable results. Using a flexible and practical tools-based approach, combined with their proven psychology-based methodology, they focus on developing growth mindsets to enable people to think and work differently, and to help them define a clear and shared vision. Ensuring high quality leadership within any organisation, large or small, has always been a challenge, and much has been written on this subject. Pick up any leadership book or read any leadership material and it must seem like the Holy Grail is waiting to be found! From our own extensive research and experience, we at Thinking Focus believe that there are three key areas to focus on to become a quality leader, which in turn will bring about organisational success. Below, we discuss these three areas, as well as giving tips for leaders to focus on in order to improve performance. When reading the following, consider yourself now against the areas mentioned: where do you see your strengths and where are your development areas? What do you, or others in your organisation, need to concentrate on to become high quality leaders? Ask yourself our 10 questions – and answer them as honestly as you can. Then act on the information you have to make the improvements needed to achieve your aims. Creating, and continually encouraging, a supportive, inclusive environment: Environments don’t just happen; they need to be created. The most basic question any leader should be asking themselves is “what type of environment do I want to create?” The most successful organisations worldwide ensure that the environment they create supports everybody – through effective HR policies, great inductions, mentoring and coaching schemes, and other forms of employee engagement. High quality leaders recognise the value of having these in place as a motivating factor and ensure their people are really included in decision making processes. Shaping your organisational structure and processes for great success: Once quality leaders understand the ‘what’ (environment) they focus on the ‘how’ (structure and process). As a great starting question, and one that should be constantly revisited, these leaders know the answers to “what structure, systems and processes would be the most helpful to support our overall vision/aims?” This question allows leaders to focus on the ‘nuts and bolts’ of their business considering, for instance, whether the structure actually supports people, really is customer focused or can demonstrate attention to quality. High quality leaders know structure and process must help, not hinder, organisational success and implement them rigourously. Master the fundamentals of your business: Any great leader works at mastering what makes organisations tick – particularly their own – whether this be through self-learning, through mentoring or through development programmes. High quality leaders make understanding “what key business principles do I need to learn and master?” a daily task. Strengthening The Team: Focus on the people side of leadership, and the importance of developing and motivating the best team a leader can have working with them. Ensure the team you have has the right people doing the right things: Any leadership text will highlight that leaders need followers – and in the world of the organisation, this is about having the right team. High quality leaders not only recruit the right people, they place them where their skills will be used to maximum effect, ensuring both business success and individual motivation. As a leader, knowing the answer to the three-part question “what does each of my team bring to the party, how effectively are their skills being used and how might their skills add even greater value?” is essential. And this is not a one-time question, but an ongoing one. High quality leaders are constantly aware of the skills mix of their people and move their teams around for maximum success. Make sure everyone fully understands their role – and how this fits with your vision: There’s a great analogy often used to demonstrate this point about two stone cutters working in a quarry and they are both asked what they are doing. Stonecutter one replies “I am cutting stone” – clearly demonstrating they understand what they are doing. Stonecutter two responds “I am part of a team building a cathedral” – clearly demonstrating they know not only what they are doing, but how it fits with a bigger picture. High quality leaders understand this point and make sure that the people they work with know not only what they are doing, but also why. These leaders ask the question “what can I do to bring my vision to life for everyone?” and then engage everyone in answering it. Understand that relationships matter: Everyone in an organisation, or indeed who interacts with it, is important – and high quality leaders understand this and work at it. Knowing how to interact with people, how to effectively delegate to motivate and develop people, how to develop a relationship of trust and how to communicate effectively are all important factors that great leaders understand. Answering the questions “which of my people skills need the most work?” or “which relationships do I need to focus on the most?” gives great insight – and helps to forge a development path to gaining new skills, or brushing up on existing ones! Seizing The Opportunities: Focus on building on all of the above, then allow high quality leaders to be the most proactive they can be and either make the most of opportunities as they arise or, ideally, create new opportunities for success. Dig around in your organisation – find the opportunities: When everything is running smoothly, as it will be if the organisation has been shaped and the team strengthened, reflecting on how everything is working is a key trait of high quality leaders. Unwilling to rest on their laurels, effective leaders will be constantly exploring how things are working, highlighting areas for improvement and seizing these opportunities. Ignoring the rule of “if it ain’t broke, don’t fix it,” they probe what’s going on with a view to continuous improvement. Make answering the question “where is there an opportunity for improvement in this?” one of your daily habits. Reduce reaction times on vital knowledge – and create sources of information: Opportunities are always presenting themselves through the information that surrounds us – high quality leaders not only make the most of this, but also find ways of ‘being in the know’. Regularly reading trade journals, attending seminars and networking events, following the news, and really listening to what’s being said in meetings are all seen as opportunities to take in something vital before turning it into meaningful action. Knowing something and filing it for future reference may be helpful, but turning that knowledge into an opportunity for creative thinking and speedy action is the way of the high quality leader. Make sure when vital knowledge comes your way you can immediately answer the question,“what’s the most creative way of using this information for organisational success?”. Make innovative leaps in everything you do: High quality leaders know that unleashing their own creativity, and that of their people, holds the key to so many problems, challenges and opportunities. Creativity is no longer the gift of the select few in organisations: a function of leadership is to harness the creativity in everyone. Most managers and leaders are able to look at where incremental improvements can be made; the most effective leaders look to move things up a gear; consider how to develop creativity and innovation to ensure that they are prepared to make giant leaps, not small steps. Answer “what’s the most creative and innovative thing I can do with this?” regularly – and make sure your creativity skills are topped up at all times! From working with our clients, we believe that by following the nine tips above, and putting in the time to answer the ten questions within them, anyone can start to increase their leadership capability. You may already be doing some of the above, and only need to work on just a few of the areas. Whichever approach you need, and decide, to take, as a high quality leader make a commitment to do something with the information above!